For over 20 years, Corky Carroll’s Surf School has provided the very best private and group surf lessons Huntington Beach has to offer. Ranked the top surf school in Huntington Beach, our mission is to get you catching waves and having fun right from the start. Bolsa Chica State Beach in Huntington Beach was chosen for Corky Carroll’s Surf School because the location, conditions, and waves make it an unbeatable combination for learning how to surf in Southern California. Stretching from Santa Barbra to San Diego, the roughly 220 miles of Southern California beaches allow for many locations to choose for your private and semi-private surf lessons. Surf City’s Bolsa Chica State Beach has a gentle break, a sand bottom, and mild water temperatures year-round making for ideal beginner conditions. Learn more about Bolsa Chica State Beach and why it’s Orange County’s hidden gem for surf lessons. Surf lessons during our summer season include surfboards and 1 private hour with an experienced instructor. After the initial lesson, you have the option to add a 2nd hour with your instructor for just $40 more. The best part is that the equipment is yours to use for the remainder of our day (until 2pm on weekdays and 11am on weekends). That means you can practice on your own all afternoon at no additional cost! Want to learn how to surf but don’t want to leave the kids behind? This package is excellent for families as kids can get signed up for our Beach Adventure program while parents enjoy taking surf lessons. Corky Carroll’s Surf School is OPEN YEAR ROUND so there’s never a better time to learn how to surf than right now. During the off season, the sun is still shining, the weather is mild, and Bolsa Chica is still providing the best beginner waves in Southern California. The beach and water are less crowded creating a perfect environment for beginners to learn how to surf. We offer 2 full hours of private instruction giving each student more time to practice, ride waves and reach their full potential. Surfboards and full, winter wetsuits are provided to keep you warm and comfortable during lessons. Don’t wait until summer, sign up today! Want a more personal touch? Call us at 714-969-3959. We would love to hear from you! Planning a special event for a large group? Corky Carroll’s has it covered! 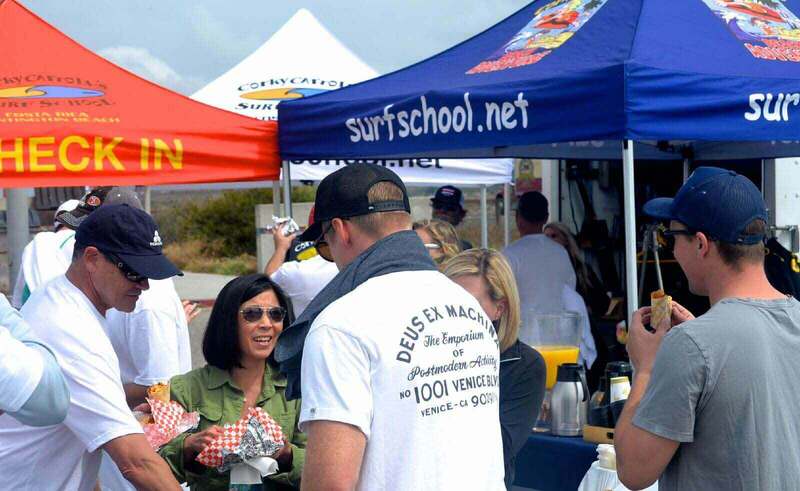 We’re the original surf school in Huntington Beach to provide this type of experience for big gatherings and can accommodate up to 80 people. Call us today for a quote! Our Private Lesson Program is excellent for surf enthusiasts who want to take their skills to the next level. Lessons include boards, wetsuits and private one-to-one professional instruction from the sand to the water. Our instructors utilize proven training methods that help to improve your skills one step at a time. Taking multiple lessons allows the student ample time in the water while further developing their ocean awareness and ability to confidently select the right waves. As an added bonus, students in this course receive unlimited use of equipment every day of the week (within operating hours), in order to practice on their own until the next scheduled lesson! *We recommend taking one single lesson before purchasing the package and if you choose to continue the course, the cost will then be applied to the package total. No need to reserve your practice time just show up and go! If you want to sign up for one of these programs. Start out with booking a 1 hour lesson above!!!! Groups of 60 or more—no problem! Corky Carroll’s Surf School has been providing Huntington Beach with surfing lessons for over 20 years. Our team of instructors have an abundance of surfing knowledge and experience giving our student’s a strong foundation in solid surfing fundamentals while also allowing us the flexibility to teach all levels of surfing. We start with the basics and before you know it, the student is up and standing—while feeling safe and comfortable in the ocean. Corky Carroll’s surf instructors use testing drills once the fundamentals are taught to assure the students get the very most out of their surfing lessons!